Rukus Avenue Music Group CEO Sammy Chand announced the landmark deal with Dash Radio to start the world’s first mainstream platformed South Asian radio station called Rukus Avenue Radio. Dash Radio CEO Scott Keeney, or otherwise known as DJ Skee commented “"Dash has always been successful focusing on often overlooked genres. The potential for Rukus Avenue and the music of India is massive with an underserved market ripe for premium live audio content. We are excited to welcome them into the Dash family." Featuring one of the more unique collection of artists to appear on album last year, The Black Prince is now available for download to celebrate the Video On Demand/Digital release of the film. Starring Satinder Sartaaj, Shabana Azmi, and directed by Kavi Raz, the film is about the last Maharaja of Punjab, and ended up being one of the top grossing films of 2017. The accompanying album featuring the star of the film Satinder Sartaaj and also Nelly Furtado, Emmanuel Jal, Talib Kweli, Tisha Campbell, Raxstar, Hoodini, Andrew T Mackay, Meghdeep Bose, Raaginder Momi, Prashant Aswani, Ozark Henry, Saum G, Ak AKA Amazing, Ozomatli, Chali 2na, and music by Sammy Chand. Bollywood star Nargis Fakhri becomes the first actor to sign with Rukus Avenue. The longtime Indian Cinema lead will be represented by the North American entertainment company going forward and is an unprecedented agreement for Rukus Avenue. Nargis will be working on some new initiatives in Hollywood including her ongoing success in Bollywood. Nargis first came to success through her hit tv show "America's Next Top Model" and then went on to act in over 11 different hit films, including her breakout film Rock Star. Nargis joins an entertainment company that is increasingly becoming popular for its strong management team, and her American roots make her a perfect fit for Rukus Avenue. Rukus Avenue CEO Sammy Chand offered his thoughts "We're honored to be working alongside such an accomplished actor like Nargis, this is truly an evolution for our company, and we're really excited about all we can do together." Hip Hop star Ruby Ibarra is featured in Times Square for a new MasterCard Grammys advertisement campaign. The Rukus Avenue star is featured on a track with SZA to promote the upcoming Grammy ceremonies as part of the #StartSomethingPriceless movement taking place to ramp up the NY city festivities in late January. Ruby was recently featured in Billboard Magazine in the Philippines and is fresh of an international tour. She will be performing in Los Angeles on January 13th to promote her new album Circa 91. World Famous Punjabi-Sufi superstar Satinder Sartaaj has signed a multi-year deal with Rukus Avenue Music Group. The renowned poet and decorated singer will bring his illustrious career to one of the most exciting record companies in the world. 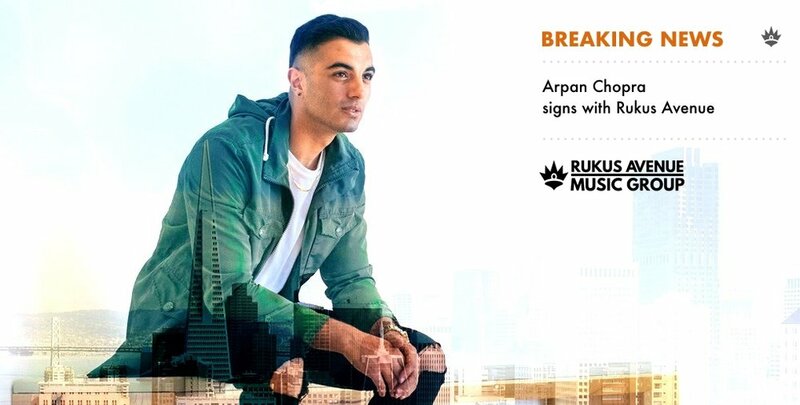 Rukus Avenue Chairman/CEO Sammy Chand described the signing as "a dream come true" as word started to make its way into the music community. "I'm excited about the possibilities, Satinder Sartaaj has always been one of my favorite artists, so it's certainly a dream come true. Satinder Sartaaj is no stranger to Rukus Avenue. This past summer Rukus Avenue released the Music Inspired By The Motion Picture for the The Black Prince, which starred Sartaaj. Sammy Chand and Satinder Sartaaj also collaborated on several pieces through the soundtrack, as there is sure to be more of that musical partnership to come in the upcoming months. Satinder Sartaaj has been hard at work finishing up his The Black Prince tour, which will see him tour through England and the prestigious Wembley Arena in March. Sartaaj will be the focus of further collaboration through Rukus Avenue, along with several initiatives inside and outside the studio. The Bollywood Legend has crafted some of the most iconic music in Indian Cinema history, and his signing with Rukus Avenue brings a new chapter to this music icon. The trailblazing efforts of Bappi Lahiri continue at Rukus Avenue as he puts together a sound unlike any other in Los Angeles. Rukus Avenue CEO, Sammy Chand announced in a statement "Our long standing admiration of Bappi has now evolved into a working relationship, and we can't be more honored. I'm in complete admiration of his amazing ability to keep reinventing himself, and this move shows you his willingness to always look ahead." Bappi Lahiri will be releasing music in 2018 with some interesting names in the coming weeks. Stay tuned for more on this groundbreaking signing. The dazzling hip hop star Ruby Ibarra has signed with the Rukus Avenue Music Group, as the deal was completed last night in Los Angeles. Ruby's recent work on Rukus Avenue's White House collaboration with President Obama was the debut of Ruby's work with Rukus Avenue, in addition to her featuring track with Sammy Chand on the United Nations collaboration in January. Stay tuned for more information as we share more about Ruby Ibarra! In the meantime, check out her track on the UN album Music To Inspire : Artists UNited Against Human Trafficking. Sammy Chand attended the London Indian Film Festival Opening Night for the film The Black Prince. Sammy produced the music for the soundtrack Music Inspired By The Motion Picture The Black Prince, that features Talib Kweli, Tisha Campbell Martin, and of course Satinder Sartaaj. Satinder Sartaaj and Sammy were both on the red carpet together as the duo were there for their upcoming work together on the soundtrack. Sammy did three songs with Sartaaj including a song called Shabana Pal that was world premiered by BBC radio. The two will be in Toronto for the release of the soundtrack in Toronto on July 13 and 14th. Rukus Avenue To Release The Black Prince Soundtrack on July 14th. The 15 track soundtrack features a very diverse sound, weaved together by a narration by AK. Sammy Chand's new single The Elephant is available on Rukus Avenue APP. The lead single titled The Elephant is from Sammy Chand's upcoming album The Inside Job. The energetic single is a fine balance of power and grace and is available exclusively on the Rukus Avenue APP. The track will be available worldwide on April 28, 2017 on iTunes and other digital outlets. Releasing on April 28th, the single will also feature an extended version of the beat. American music star Vanessa Carlton's track House of Seven Swords is featured on the Rukus Avenue album MUSIC TO INSPIRE, a collaboration with the United Nations to fight Human Trafficking and raise money for the UN Voluntary Trust Fund. Vanessa was recently in Toronto for a show and was presented a CD by Rukus Avenue VP Raoul Juneja. Vanessa's contribution to the Music To Inspire CD is a big one, as her track is a part of an all-star cast of over 50 artists and contributors that all gave to this cause. Vanessa is currently on tour and will return to Los Angeles this April to begin work on her next album. Rukus Avenue's very own Saum G will be taking the stage on March 10th at Bardot in Hollywood, California. The producer and singer will be performing with this signature Cello and will be blending his cutting edge sound with genres like EDM. Rukus Avenue's new star is already garnering a big buzz following his performance and inclusion in the United Nations anti-human trafficking album Music To Inspire. Saum G will be performing songs from his upcoming album, including the acclaimed "Not For Sale" which is his collaboration with vocalist Varshini Muralikrishnan. The show will begin at 7pm and will feature other opening acts to be announced shortly. Roon and Astoic are two artists that have been confirmed so far. Rukus Avenue Team presents A.R.Rahman with Album. The Rukus Avenue team made a quick pit stop in Toronto, Canada to meet with the great A.R.Rahman and share the project he contributed to. The Music To Inspire album - Artists UNited Against Human Trafficking features two tracks by the Maestro. The weekend festivities also featured some of A.R.Rahman's new project's coming out soon too, like his upcoming concert film called ONE LOVE. The Rukus Avenue team was invited to a special world premiere screening of the brand new directorial debut by A.R.Rahman, but also got a chance to discuss the project with the man. Sammy Chand presented A.R. with a special commemorative pin given to him by the United Nations Office on Drugs and Crime. He wore the pin on his sleeve as he took the picture. Rukus Avenue Chairman delivered a passionate 10 minute speech at the United Nations Headquarters in New York with H.E. President of the General Assembly Peter Thompson in attendance and other noted dignitaries. The speech touched on the need for the galvanized community to step up and provide support and awareness for the first full activation of the One For All campaign launched by the United Nations. An album to help end Human Trafficking. The 17 Sustainable Development Goals as set forth by the United Nations for 2017 are an active initiative of the United Nations. Rukus Avenue's Music To Inspire album Artists UNited Against Human Trafficking is one of the first activations of the One For All fight. Buy the album online now! Garbage - Where Do The Children Play?